Maui is my favorite Hawaiian island. Frankly my dear, I would not be opposed to retiring on the island of Maui. I already envision myself at sunset, strolling along the shore with my husband, with the water lapping at our toes. I glance around the area and smile as I see my daughters, with their children enjoying the last rays of the sun. I can feel the warm breeze, and hear the comforting crush of the waves, and I feel at peace. When I saw that Trip Advisor had named Maui number two in the world, of the top 10 islands for 2015, I was pleased, but not surprised. I raised a shaka sign, and smiled. 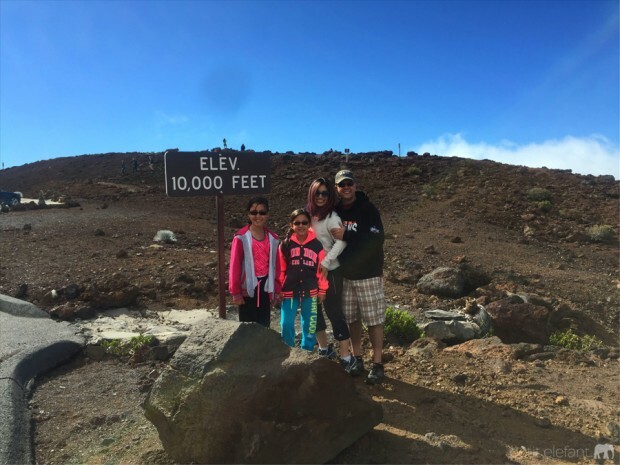 In April, our family of four went home to Maui for about ten days. I say home, because as soon as my feet touch the ground in Hawaii, and I breathe in, I’m home. In all our travels, there isn’t another place that has felt like that to me. Maui is the second largest of the Hawaiian islands, and the third most populated, following O’ahu and the Big Island. For us the Big Island is wild, and arid. O’ahu is busy, and slightly crowded. Maui is simply a beautiful island, filled with what you imagine a tropical paradise to be, with places to explore and lose yourself, and places where you can get in on the action. This trip we were grateful my husband was a top performer in his company. The company paid for our hotel for a few days, and flights for my husband and myself. We paid for the extra nights we stayed before and after the company dates, and flights for our daughters. 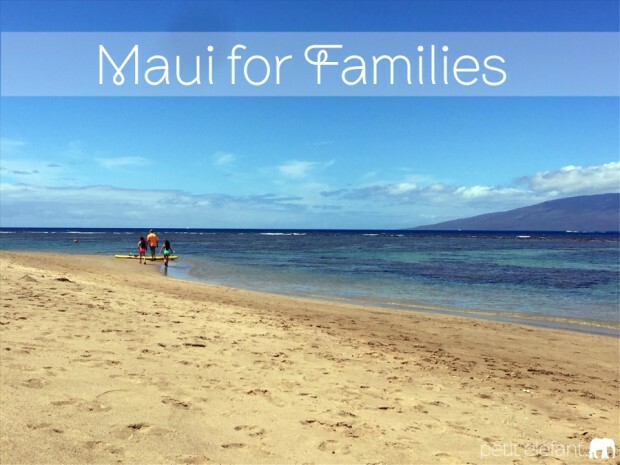 I hope you enjoy our Maui for Families guide. We love using VRBO to find fabulous deals, and condos to rent. I’m also looking forward to trying out Airbnb one day. You can’t beat the deals when you rent out a condo. Lahaina is located in West Maui. It’s a popular place to visit. We love Front St in Lahaina. There are so many darling shops and restaurants that line Front St. Lahaina is a convenient location to make your way to Kaanapali, and other towns on the West side of the island. Kapalua is where golfers love to go. The course in Kapalua has been featured on PGA tours, and the view of the course, with the ocean as a backdrop is breathtaking. We’ve always loved Kapalua for it’s laid back, less-busy style. 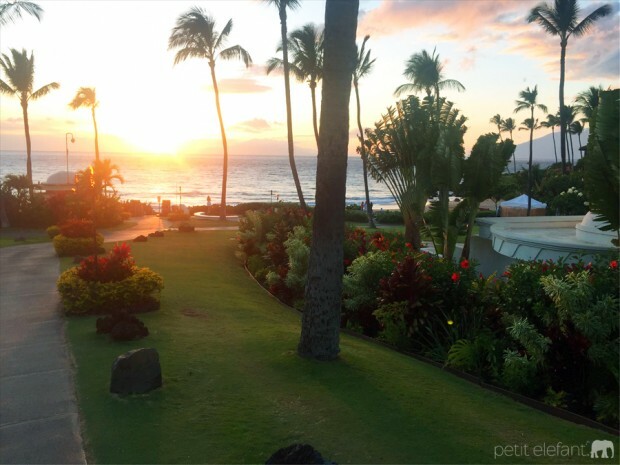 Wailea is filled with resorts, and shops and areas that cater to resort-loving folks. It’s close to Kihei, where you’ll be able to hit up local eats, and explore. Wailea and Kihei are closer to Haleakala, and the Road to Hana. Wailea is also close to Maalaea, where the Maui Ocean Center is. During whale season you can catch incredible views of the whales as they swim by. Our family loves to enjoy good food. While most people focus on shopping, we are obsessed with finding the best bite. Below are some of our favorites. Happy eating. 808 Grindz Cafe – Located in Lahaina, a bit off the beaten path, just a walk from Front Street. It’s a local breakfast joint. At first glance it seems unimpressive, a typical hole-in-the-wall. The wait outside the restaurant is standard. The food inside, will blow your mind. We highly recommend the banana pancakes with their homemade mac-nilla sauce. It’s sinfully delightful. If you love Eggs Benedict, choose the Crab Benedict with their homemade fried rice. You’re welcome. Aloha Mixed Plate – In Lahaina, this place is an institution. Great views, good food. I went for the Loco Moco. If you’re on the island and you don’t try the traditional fare, I can’t be your friend. Also, plate lunches. It’s Hawaiian style and I could eat plate lunches every day and still want more. Coconuts Fish Cafe – Best fish tacos for the discerning party palate, in Kihei. They serve their fish with layers of flavor. The fish is not shredded to bits, it’s there in satisfying chunks for you to enjoy. They also have a fabulous seafood pasta, I go for the red sauce, but they do have a white sauce too. Don’t leave without trying the fish tacos here. Just stay and eat. It’s the best solution to everything. Honolua Store – This is located in Kapalua, near the Ritz Carlton. I love this store. It’s got all sorts of sundries you can purchase, and then tucked in the back is where you can order up mixed plates. The menu changes daily, but the quality, quantity and price for a mixed plate means you’ll want to return for more. Hula Grill – Eat with your feet in the sand in Ka’anapali, at Whaler’s Village. Or, eat in the area where there isn’t sand. You choose. I love the views, I love the activity at Whaler’s village. This is just a fun place to be. Lahaina Grill – If you’re looking for an elegant, and splurge night out, and you want to enjoy the kind of service that will sweep away your crumbs between courses, this is the place. The food is lovely, and located in Lahaina. You simply just sway your way in and sway your way out. Easy, breezy. Lahaina Luna Cafe – If you visit Lahaina’s Front St and you don’t eat here, I don’t even know who you are. Seating is outside, just find a table. The food is fresh, the flavors are bold, and the service is chill. We started and ended our time in Lahaina eating here. I miss it. The icing on the cake? Or rather, the snow cap on the shaved ice? Lahaina Luna Cafe and Ululani’s shaved ice are partners, and next door neighbors. Everybody wins, especially hungry people. Maui Lavender Cafe – Located about halfway up the summit of Haleakala, and next door to Eco Adventures Ziplining, this is the perfect little place to grab a quick bite. They have homemade granola, and root chips. They make a lovely tomato, pesto, feta pizza, and the service is sweet and attentive. Plus, indulge your lavender senses here. I do have to warn you, there are only port-a-potties here. So bring your hand sanitizer. Sansei – Butter fish. Get that. Also, the brussels sprouts, and the sushi, and… it’s all good. There are many locations of Sansei. We love the vibe of the Kapalua location, there’s also a Kihei spot. They also have some other locations on the other islands as well. If you go during happy hour, you’ll get some dishes at half price. Star Noodle – Top Chef Sheldon Simeon’s Lahaina restaurant is a definite star. The location is a bit off the main area in Lahaina, but so worth the short drive. Make a reservation ahead of time, the place is always hopping. With contemporary decor, and a communal table in the center of the restaurant, the food has a gorgeous place to live, at least until it finds a permanent residence in your belly. The ramen, the pork buns, the brussels sprouts, and seafood, are flavored with punch and panache. The service is quick, friendly, and accommodating. 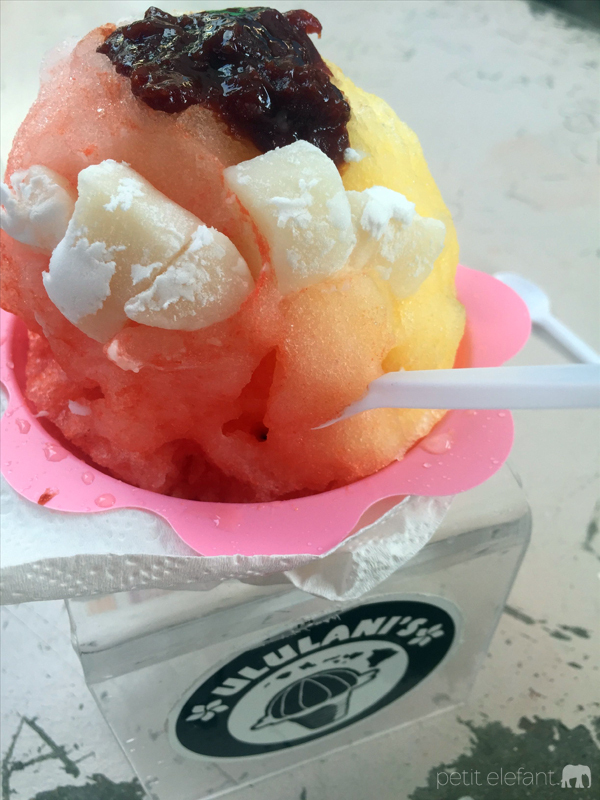 Ululani’s Shave Ice – In Italy we say yes to gelato. In Hawaii, say yes to shaved ice. By yes, I mean yes to everything. Add adzuki beans, mochi, Haupia, toasted coconut, and a snow cap to your shaved ice. You will be glad you did, and then you’ll want another. While we were on the island we filled up two, frequent dining cards of 10 shaved ice each, and earned two free ones. Just writing about this, makes me crave one right now. You need to try the Calamansi, Tamarind and Melona. Don’t be boring, try something you’ve never had before, and hit it up, local style. My girls always got the micro size, and my husband and I stuck with the small. It’s like it’s own meal. Perfection. Baby Beach in Lahaina, minutes from Front Street is one of the most calm beaches we’ve ever been too. It’s also shallow for a long way out, just remember to bring your water shoes, as there is coral. The snorkeling is easy, the sand is soft, and this beach is fantastic for families. DT Fleming Beach has consistently been on the lists for America’s Best Beach. It was named after DT Fleming, the man who introduced pineapples to West Maui. It’s a great beach for surfers and body boarders. DT Fleming Beach also has lifeguards. The truth is, if you’re a true local, you can pretty much just park anywhere you see water and sand, and there’s your beach. Just remember to be aware of currents and know that if there aren’t life guards, you’re responsible. So stay safe. Canoe Ride at Fairmont Kea Lani – Located in Wailea, this is a free excursion for guests of the hotel. However, it books up fast and there are limited times. So if you know you’re going to stay at the Fairmont, book it asap. I called right away when I found out we were staying at the Fairmont, and the only open time available, was a 6AM slot. A little tidbit about my family, we’re not early birds, we’re night owls. I knew it would be a challenge to convince my husband to do this. I also knew it would be a struggle to wake my family. However, once we were out there, it was rejuvenating. There’s something so lovely about hitting the water before anyone else, and enjoying the peaceful undulations of the ocean. I’m proud to say, they were all pleased to do it. It was a treat to see a honu (turtle), manta ray, and even whales that early in the morning. Skyline Eco Adventures Zip Lining – We wanted to do something adventurous now that our girls are a bit older. We found Eco Adventures on the free map Hawaiian Airlines gives to passengers, and I noticed that kids were 50% off. Our kids luckily met the 65lb weight minimum for the Haleakala zip line. Which worked out great, because we also wanted to visit Haleakala. The Haleakala course had five lines and a suspension bridge. It was a blast. You have to sign a waiver that gives up your rights to everything, but the guides are efficient, friendly, and careful. My girls were nervous, and panicking before we got there, but once we started zipping around, they loved it. They both want to do it again. We highly recommend it. Haleakala National Park – Since we were already halfway to Haleakala when we zip-lined, we drove right on up the rest of the way. We were told to make sure we drank lots of water, and took it slow as our bodies adjusted to the altitude. We didn’t have any problems. Every body is different, genetically, so every body may react differently. So take it slow, and if it gets too difficult, turn around. There’s a visitor center, and then a higher look-out point. It was gorgeous. We literally had our heads in the clouds. Haleakala means house of the rising sun, and standing there as the sun burst through the clouds, Haleakala was perfectly named. Helicopter Tours – The island abounds with helicopter tours. This is a solution if you want to see lovely hidden gems and you don’t want to drive the road to Hana. I’ve done a few helicopter rides, and they’ve all been lovely, although I’m not crazy about how loud it gets, it’s fun to do every now and then. Dinner cruises/Snorkel Tours – plenty of outlets that sell tickets to these adventures. My husband and I did a dinner cruise on our honeymoon, and did a snorkel cruise to Monokini out of Maalaea too. There are so many places in Maui that will sell you these excursions. Enjoy! I love the island of Maui. There is so much to discover, enjoy, and learn about. Or you can do absolutely nada. One visit to this lovely island is not enough. I hope this Maui for Families guide gives you a taste, and that you return, often, to my favorite island. I made a video of our trip to Maui. You can find it on my YouTube channel. Interested in more travel posts from yours truly?